Gulab Singh Johrimal (named for the founder) has called Chandni Chowk home for 200 years, selling perfumes, essential, oils, ittar and more. At a loss for gifting options? 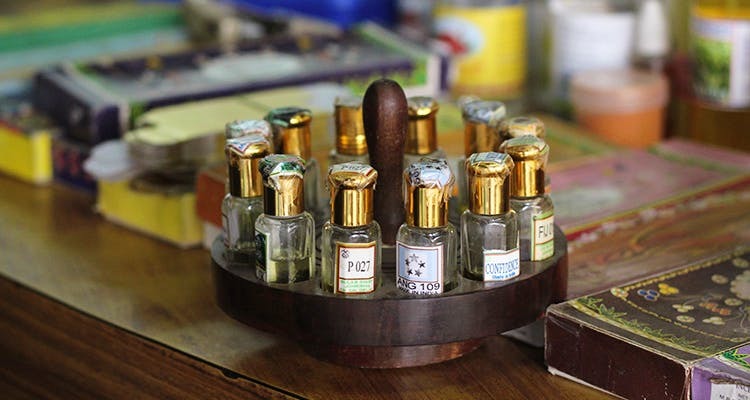 Go back to your roots and check out some good ol' au naturale perfumes and ittar. Established in 1816, Gulab Singh Johrimal has logged almost 200 years in the business of creating perfumes. Even today the store is full of patrons looking for their signature scents, and tourists walking in because of the aroma. The store has more than 15 different kinds of ittar, extracted from sandalwood, infused with floral elements. These are slightly expensive, but have characteristics that match different seasons (light florals for the summer and woody, musk tones for winters). You can also opt for a less concentrated version—choose from their 100 different kinds of essential oils and perfumes. We loved the bergamot, lemongrass, citronella, peppermint and jasmine; and best of all, you get them in little bottles of your choice. If you want something more contemporary, they have a range of aromatherapy sets, incense sticks, room fresheners and pot-pourri. Cones, soaps and various different perfume accessories also find space on their glass shelves. The staff is extremely helpful, and will patiently assist you in finding the exact aroma you’re looking for. And lest we forget, there was never a better budget gift. You will have to travel all the way to Dariba to get a bottle of Gulab Singh's attar, but it'll be worth every bit. If it's any reassurance, you can also get their incense sticks and essential oils on iTokri's website. The variety will be limited, of course. Get a box of varied scents that come in tiny bottles. That way, you can try multiple scents over time and finalise on a bigger bottle later.